Abstract: Airwheel intelligent electric scooter S5 is one of the new products, which Airwheel rolled out in June, 2015. S5 not only is a new means of vehicles, but also can be applied to some specific industries. As intelligent electric scooter, S3 was termed as the top of Airwheel technology and design before. At present, the new product S5 has been launched, and it was upgraded from many aspects. Airwheel intelligent scooter S5 not only is a new means of vehicle, but also can be applied to some specific industries. As the latest product, Airwheel 2-wheeled electric scooter S5 integrates the most powerful performance of S3. Not only that, it hew out a new way of self-balancing electric scooters. S3 focuses on daily commuting, while S5 pays more attention to its off-road function. The maximum peak of Airwheel S5’s motor is 1500W, and its output power is the biggest in all models of Airwheel self-balancing scooters. The powerful motor makes it easy for S5 to climb hills just like ride on flat roads. 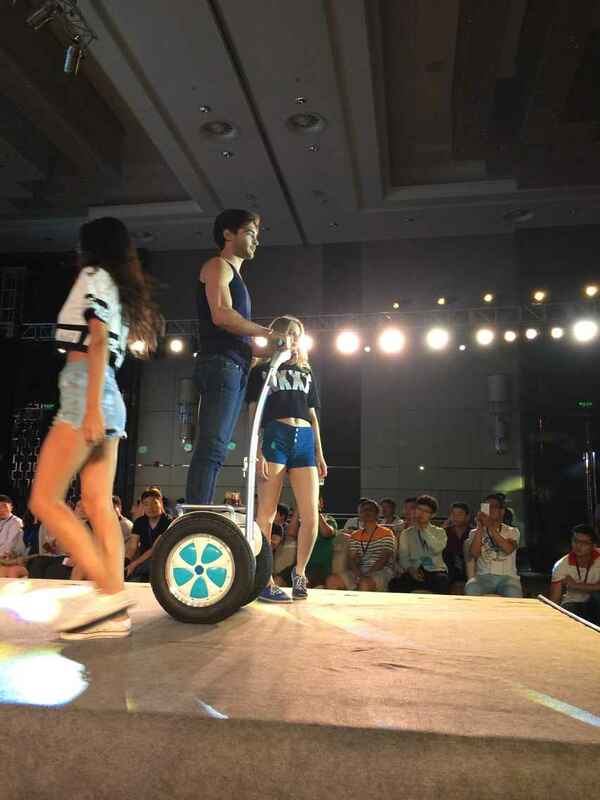 The battery capacity of Airwheel S5 is up to 680Wh, and also is the biggest of all. The larger the contact area between tyre and ground is, the greater the force of friction they will exert. The better gripping performance makes S5 easily cross the washboard road. Which brand of tyre does Airwheel S5 choose? Of course, the world renowned Cheng Shin Tyre. Moreover, to improve its movement, an off-road- style metal shelf is added to S5. At the first sight of S5, you’ll know it is rougher than any model of Airwheel self-balancing scooters. What’s more, Airwheel intelligent self-balancing scooter S5 can be applied to some specific industries, such as police system, photography and exhibition activities. For instance, if S5 is used for security patrol, the security guards can ride S5 in villas, shopping malls, amusement parks or industrial parks. If S5 is used by photographers, it may replace the photography moving track. As long as you can think of, maybe Airwheel electric scooter S5 can come in handy. Airwheel 2-wheeled scooter S5 was rolled out just now. So the public may not understand it well. But as long as ones try it, they will find that how practical it is! I believe S5 will lead a new trend of Airwheel 2-wheeled electric scooters. Next：The Renewable and Clean Energy Is Guiding Airwheel Intelligent Self-balancing Scooter.